Walmart will open its first "high-tech consolidation center" — a 340,000-square-foot facility that receives, sorts and ships freight from suppliers before sending it to a distribution center — in Colton, California this July, according to a press release. The facility will employ 600 workers and move three times as many cases as a traditional distribution center. The Colton facility is not the company's first consolidation center, but it will be the first equipped with a new software system that reduces manual labor. "Right now, merchandise suppliers create and ship 42 separate orders" to send merchandise to each of the company's 42 regional distribution centers, Walmart said. "The new system will enable suppliers to fill one massive order instead of 42." "Think about it this way," Walmart explained in its press release. "Let's say there are 10 place settings on a dinner table with plates, silverware and glasses, and it's time to clean up. If one plate is grabbed at a time, it will take 10 trips to set them all in the sink. But, if you stack the plates, cups and silverware, it only takes a couple of trips." The analogy applies to the company's consolidation centers, designed to route products to customers more quickly by consolidating multiple less-than-truckload shipments into full truckloads sent to the company's regional distribution centers. This way, Walmart says, distribution centers can focus solely on fulfillment. 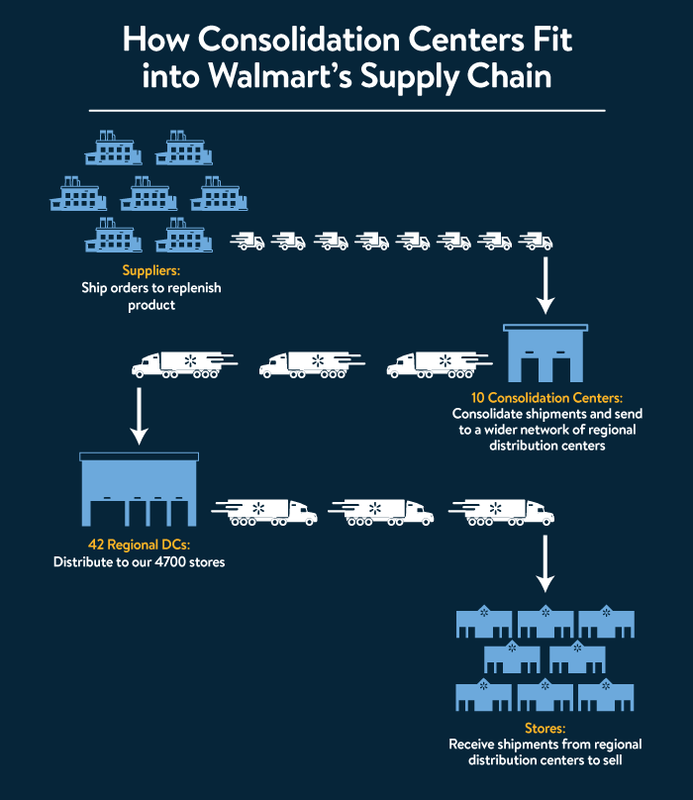 The news marks the latest step in Walmart's quest to optimize its upstream supply chain by working with suppliers on their logistics processes. Walmart signaled that intention to its partners as early as 2016, when the company said at its annual supplier conference it was considering tightening its inbound logistics policies. By late 2017, the company announced it would penalize suppliers that did not send shipments on-time, in-full (OTIF) at least 95% of the time. To comply with the new policy, many suppliers not only had to shift their packing and quality assurance processes, but they had to learn to work with a standardized supplier appointment scheduling system. "There is a right path to get to OTIF, and that right path is through investing in data, investing in planning and making sure your organization is ready to engage at a 95% level," Kathryn McLay, senior vice president of supply chain flow at Walmart, said at the time. A new software helping consolidation centers and suppliers alike fulfill orders more efficiently appears to be another step on that path. By automating orders upstream, Walmart claims it will help efficiency all the way down to the store, reducing order inaccuracies, boosting warehouse flexibility and making unloading simpler. "We're going to make the regional distribution centers more efficient," Geno Bell, senior director of the consolidation center network at Walmart, said in the press release. "With this new technology, we can be surgical and responsive in getting merchandise into the stores."